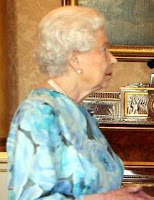 The Queen received the Ambassador of Burkina Faso and the Ambassador of Belarus at Buckingham Palace. This is a tricky one. I say Sapphire Chrysanthemum, do you concur?